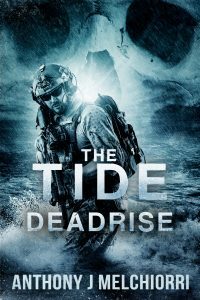 Book 4 in Anthony J Melchiorri’s The Tide series. And they were left for dead. Captain Dominic Holland’s greatest weapon against the apocalypse is his ship. The Huntress is the heart of Dom’s scientific research and military operations. And it has been taken. Dom must embark on a perilous mission to retake it if he stands any chance at finding the cure the world so desperately needs. Dom’s daughter, Kara, is stranded in the middle of Skull-infested Virginia. While she and a few others struggle to reunite with Dom and the Hunters, enemies more terrifying and ruthless than the Skulls emerge. New adversaries emerge at every turn. The Hunters are running out of time and resources. They have no choice but to rise in the face of almost certain defeat and fight to save humanity from the brink of utter annihilation.